It’s bright and sunny here for once in Rochester. So why not do a dark horror film? Because why not. I found David R. Westphal’s The Midnight Cycle this morning. Check it out. 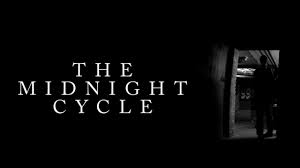 Click here for The Midnight Cycle. Absense of music can go one way or the other with me. I think where Westphal’s film works is the combination of his methods: he only has one actor, he’s in a limited space, he’s working in black and white, and he’s placed a sound where the music should be. The sound of wind rushing added to the atmosphere, so much that when our actress Lauren Calhoun pulled a bone-headed move (really, who the hell unlocks a door that’s moving like that in a dark basement in the middle of the night, even if it is in a dream?! ), we were still with her. This one creeped me out as I watched it; I was waiting for the boogeyman. It’s the waiting sometimes that will drive you nuts.